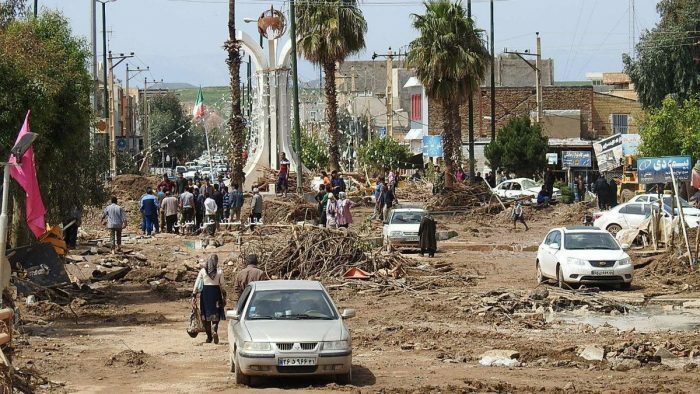 The picture of the city Poldokhtar West of Iran, after the flooding. 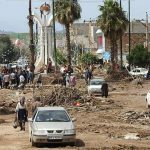 For more than two weeks, Iran has been beset by catastrophic floods, which have caused untold human and financial damage. The regime has failed to provide emergency assistance to people affected by the floods and has consistently tried to cover up the extent of the damage caused by recent catastrophic flooding across the country. On Tuesday, the Tasnim News Agency reported that Pakpour, head of the Revolutionary Guard Corps ground forces revealing in a shocking confession the current conditions in flood-stricken areas and the regime’s inaction in confronting the disaster in a telephone call to to Chief of Staff of the Armed Forces IRGC Brigadier General Bagheri. Still images of the #IranFloods leaving trail of destruction. An internal police report says that at least 90 people died in Poldokhtar during the most recent flooding, which is supported by local reports. The regime’s Interior Minister announced that “some areas of the Khuzestan river basin, especially the areas of Susangerd, Shoosh and Dezful” should evacuate, but he failed to specify where and how residents of these areas should evacuate. Neither the Interior Minister nor the news reports specified where these safe havens or camps were. Local residents say that they never received any information other than an evacuation order. People were forced to flee to the hills or their rooftops to avoid the oncoming floods. In the aftermath of the deadly floods, tens of thousands of Iranians are waiting for desperately needed government disaster aid. According to reports from the MEK network, 150,000 people in Lorestan Province lack access to drinking water. Flood victims across the country say that the government has failed to provide even basic emergency assistance. Mrs. Maryam Rajavi, President-elect of the National Council of Resistance of Iran (NCRI), described the devastating floods in Iran as a national catastrophe. She blamed the regime for worsening the effects of the flood through its destructive environmental policies and said the the mullahs’ pillaging of the nation’s wealth had led to its inability to respond to natural disasters. Mrs. Rajavi further stated that the resources of the IRGC, the army, and the government belong to the people of Iran and should be made available to them to rebuild the country. The regime must also open the country to international relief funding, which it has so far denied.